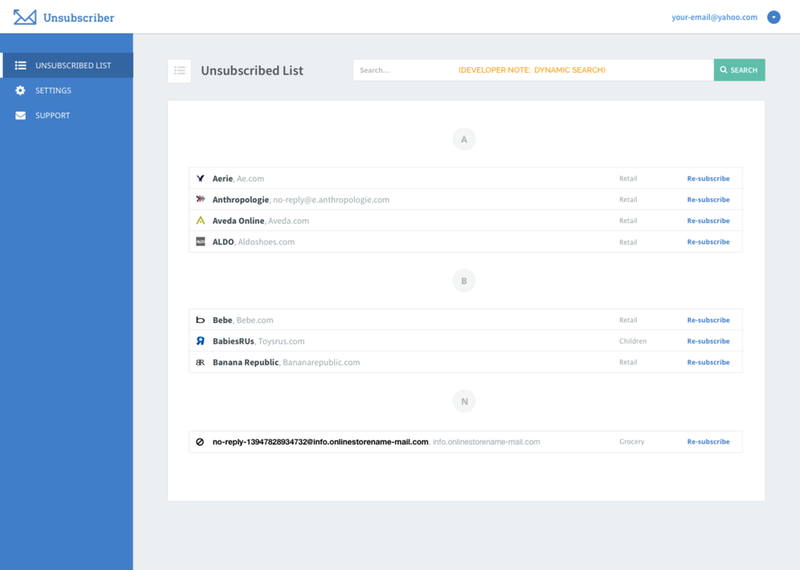 Unsubscriber uses context.io to interact with our users' mailboxes and move messages around to better organize their mail and help them unsubscribe from unwanted email. Unsubscriber is a very simple, "drag and drop" solution to eliminate unwanted email in your inbox. It has served over 6 million users in 50+ countries. Our consumer team inherited this as a legacy product from Other Inbox on aging infrastructure. Our task was was to port over to newer technology, analyze the consumer breakpoints, and update the look and feel. Our #1 business goal we needed to address was account creation. There was a problem with on the last site we ran A/B landing page experiments, adjusted the copy, increased CTA buttons, utilized google tag manager and localytics to improve the acquisition funnel. I gave the product a little mascot love. Our #2nd business goal was to reduce churn. In solving for this, we noticed that a very high percentage of users hadn't created a rule in a long time. This was a set it and forget it app but there was zero onboarding. Users weren't able to find their folder. I designed a specific onboarding flow for each of the email service providers and a generic version for IMAP clients. The primary user action for Unsubscriber is to get rid of unwanted mail by dragging and dropping mail from a particular sender into a folder in their inbox. One of the most common problems for the user was that they didn't know how to re-subscribe to a sender or that they accidentally made a mistake in unsubscribing. The decision was made to add a list in the user settings panel. Also, another design challenge was to decouple this product away from it's sister product, "Organizer." Another common problem for the product would stop working and senders that a user had created rules for, would magically show up again. Sometimes this was because of user error, sometimes this was because of inactivity. Our support staff had endless tickets for this reason. We simplified this process for support by letting them change the state of a user and gave them the capability to "view" as a user.